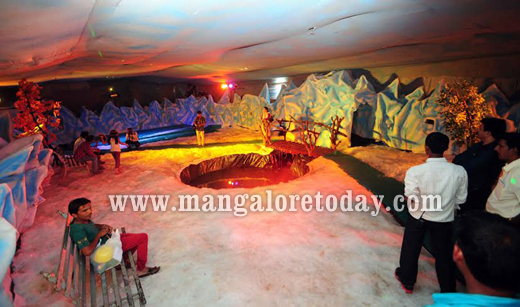 Mangalore, Sep 12, 2014: Temperatures in the city maybe soaring, but at Snow World it is raining snow! 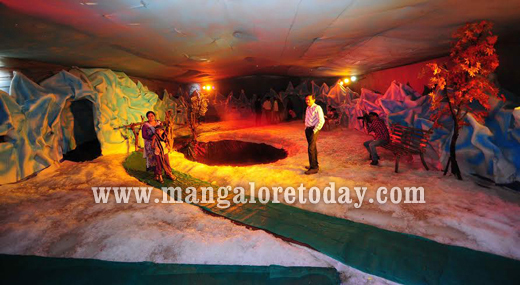 Experience snowfall and feel the scorching heat melt away at Karavali Utsav Ground in Mangalore. 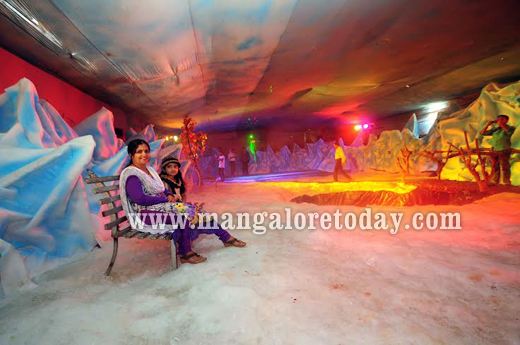 The first ever special amusement park ’Snow World’ was launched on September 11 at National Consumer Fair at Karavali Utsav Ground in Mangalore. Citizens of the port city were jubiliant to experience the "snow" amidst rain and sunshine. Peter from Bangalore the innovator stated that the snow is real, only the procedure of production is artificial. It has no impact on health and is hygienic, snow is changed regularly. 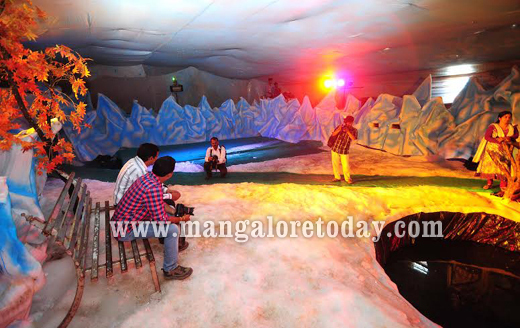 Peter along with his 35 strong team perfected the concept of snow world and executed it in Mangalore at short notice to the amusement of several people. Some of the special features are : Ice Walk, Snow Fall, Kids Dancing Area, Water Falls, Ice Pond, Ice Cave, Photography corner, special major display, Special sound and light effect are created to wow the young and old. The 45 day long National Consumer Fair comprising more than 200 stalls and 25 amusement rides displays home appliances, health and fitness equipment, furniture, designer sofa sets, handlooms, handicrafts, dress materials, footwear, books, toys, gifts, stationary and food products. The expo also has an amusement section with artificial boating lake, break dance, dragon train, Italian tora-tora, jumping frog, dashing car, aeroplane, titanic, horse merry-go-grounds, fish merry-go-grounds and many more. Manjunath and Shashidhar from Nisarga Publicity were present at the launch ceremony.